Over the weekend, the rumor mill was buzzing with reports that Kevin Durant had put a ring on it, after a photo emerged of the WNBA star wearing a huge rock on her finger, and the reports were confirmed last night. 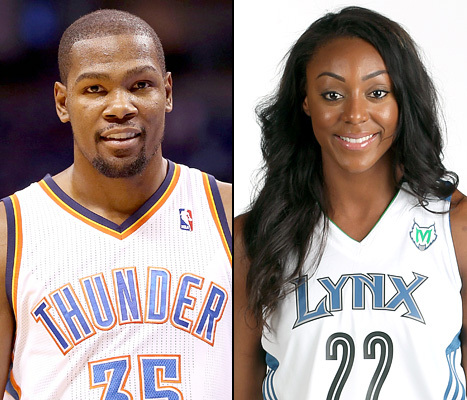 Post-game Monica Wright confirmed reports that she and Kevin Durant are engaged. So there’s that. Super CONGRATS to @monnie22 and @KDTrey5 two of my #faves so so so happy for you all! I love, love! What’s super cute about this story is that back in 2011, Kevin Durant tweeted that he needed a basketball player girlfriend, while referencing the movie “Love & Basketball.” He not only snagged his basketball player girlfriend, but she ironically has the same name as the lead character in the movie. This entry was posted in Entertainment News and tagged Am Caffeine morning show, Kevin Durant, Kurtis Blow, NBA, Oklahoma City Thunder, WNBA. Bookmark the permalink.